A five-day training course for 22 forensic technicians and experts from the Zarkarpattia and Lviv regions concluded today with a certificate handover ceremony and the donation of equipment to improve the performance of local Police Crime Scene Investigation Teams. The training course focused on how to use modern forensic equipment in different crime scenes including shootings, other violent crimes and burglaries. The principles and practice of gathering biological evidence, fingerprints, trace evidence at burglaries, evidence from shooting scenes and how to photograph crime scenes effectively were presented and discussed with participants. The course was enhanced through the use of facilities provided by the Lviv Academy of the Ministry of the Interior, which allowed the training to be as practical as possible through the setting up of practice crime scenes on site. The training was delivered by Alexandru Dena, a forensic expert from Romania’s Directorate for Investigating Organised Crime and Terrorism and organised by Mihaita Barbutu, EUAM Criminal Investigation Adviser/Trainer. 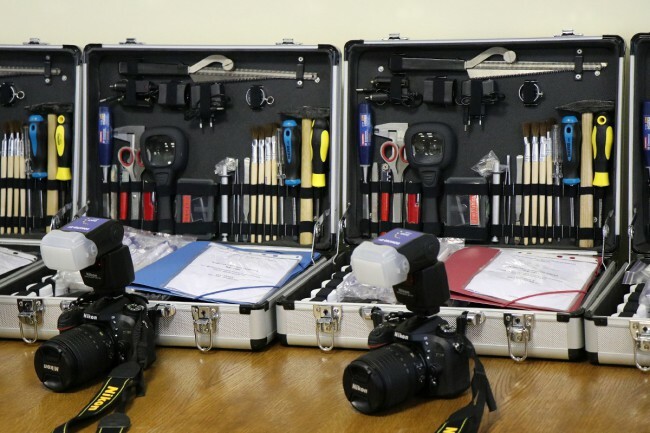 To assist the forensic experts with their work, the institutions they work for – the Zakarpattia Police, the Zakarpattia branch of the Expert Service, the Lviv University of the Ministry of the Interior and the Lviv Police Training Centre – were given a total of ten universal forensic kits, three bullet trajectory kits, 6 DSLR cameras with external flashes and one set of UV lights. The same course will also be delivered in Kyiv at the Kyiv Police Academy between 14-18 November for another group of forensic technicians from Lviv as well as a group from Kharkiv.